This beautiful cleansing balm is totally deserving of its (never-ending list of) accolades. Adored by the skin care savvy Ruth Crilly (A Model Recommends), the ever-flawless Fleur de Force and the whole of Team Cult Beauty, Moringa Cleansing Balm makes for a relaxing and soothing skin ritual; melting away make up to leave skin ‘squeakily’ clean but ethereally soft. With wild sea fennel and vitamin E to rebalance, purify and reduce the appearance of pores, and extracts of jasmine and rose to restore radiance to dull, dehydrated and more mature skin types, this deep cleans to leave your face feeling wonderfully dewy and looking clear, ‘plumped’ and luminous. The perfect way to take the day off, this indulgent balm also doubles as a therapeutic treatment mask when applied to clean skin before bathing – just massage all over face and neck before soaking in the tub for ten minutes – the steamy atmosphere will open pores and help the gorgeous oils to penetrate and lock in precious moisture. 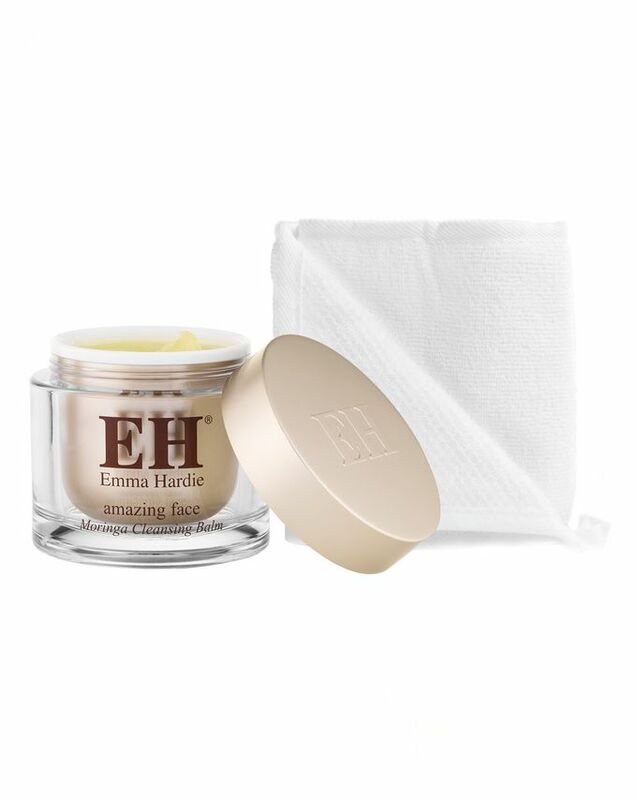 Beloved by beauty editors, bloggers and many a mere mortal, Emma Hardie Skincare’s multi award-winning Moringa Cleansing Balm is the nearest thing to clean skin heaven in a decadent, gold-toned jar - now available in limited edition 'Supersize' for 22% less than the recommended retail value! An absolute joy to use, this velvety balm not only smells incredible – an intoxicating cocktail of essentials oils of orange, neroli, mandarin, jasmine and rose – but conditions your skin as it cleanses; effortlessly eliminating every trace of make-up and grime, whilst replenishing much-needed moisture. Suitable for all skin types, the star of the show is moringa seed extract; a renowned tissue-strengthener and potent source of skin-essential vitamins, minerals and antioxidant-rich phytonutrients, as well as multiple essential fatty acids which help to enhance skin’s resilience. And it lasts for ever… a very little goes a long, long way. Moringa Balm Mix a few drops of warm water with a little Moringa Cleansing Balm in the palm of your hand to create a cream. Apply to the face, neck and eye area and massage thoroughly into the skin. To remove, soak a cleansing cloth in warm water, squeeze out the excess and gently wipe over the whole face and neck, taking extra care around the delicate eye area. Caution: If the product enters the eye, wash out thoroughly with plenty of clean water. Stop using this product if you develop redness or itching. Professional Dual-Action Cleansing Cloth Soak the Dual Action Professional Cleansing Cloth in warm water, squeeze out the excess and gently wipe over the whole face and neck, taking extra care around the delicate eye area. Use the muslin side of the cloth to remove excess make up and grime and the microfibre side of the cloth to deep cleanse, buff, brighten and tone the skin. (Machine washable). Great product to start and end my day with! I’m obsessed with this product this is my second purchase and this time I got the supersize! Oh! And the Dual Action cloths are incredible! I threw out my old clothes and replaced them with the EM dual action ones! I’m in loveeeee! This is brilliant! It’s like a home facial. I have never had a skin product make my skin feel so enriched and alive and changed my complexion! My redness is reduced and left my skin looking even and feeling fantastic! I'm very fickle when it comes to cleansers - I love to experiment and try new products however without fail my first cleanse will always be this balm. I've been using it for the past three years and it is incredible. It completely changed my skin. It always gets rid of every last scrap of dirt and makes up without fail. It feels amazing on the skin and it smells so heavenly. I then will do a second cleanse with whatever milk or gel cleanser that takes my fancy but I will never stop using this as my first cleanse. It's incredible. This would be in my skin regime.... FOREVER! I have no words to describe this amazing product. The BEST cleansing balm EVER! I love everything about this from the tasteful understated jar that looks classy on the shelf, the smell, the texture, the ease of use, and the oh so wonderful results. I try other cult brands, but nothing compares to this in any respect. Love this cleanser for both taking off makeup and cleansing the skin. Smells beautiful, removes makeup and cleanses the skin, and emulsifies easily to completely remove without leaving behind any residue. Can be removed with either a warm cloth for some added exfoliation and a steam, or simply with running water and wet hands. Also, love using it for a facial massage as it smells so beautiful. This is just the best cleanser, I tried out the Charlotte Tilbury cleanser but quickly regretted not getting this again. CT one isn't bad by any means, but it's no moringa balm! Just bought this HUGE pot as I plan to never be without it. Demolishes all makeup, including waterproof, rarely get breakouts (unless hormonal) and smells like heaven!! 100% worth the money. Completely refreshed my skin and re-structured my routine. It cleanses thoroughly without stripping, and leaving the skin soft and quenched. The oils in the balm feel so pure on the skin and are noticeably more nourishing than other cleansing balms I have tried. When cleansing, I leave this on for a couple minutes as a mask, then wash it off with a warm cloth- it makes me feel like I get a facial every day. :) It smells absolutely divine, uplifting for the morning cleanse and soothing for the night one, with hints of neroli and mandarin- like a tom ford perfume. This big tub lasts me seven months, and I used it every single day, morning and night, with lots of masks here and there! The best cleansing balm in the world! First of all - I live in Canada. I have to pay the exchange from CAD to GBP and it's painful. The product usually ends up being twice the listed price and that's a lot of money for a cleanser. That being said, for the past 5 years, this has been my ride or die. I've dealt with regular adult acne, brutal cystic acne, clear skin, sensitive irritated skin - this cleanser works always. I wouldn't waste this as a first cleanse personally since the formula is just so beautiful on the skin. It emulsifies beautifully and has the most wonderful texture - it's a balm that melts into the skin without being watery. The smell is beautiful and the product LASTS. I buy the 200ml size the it lasts me about a year with regular use. I highly recommend this cleanser to anyone who is on the search for their "perfect" balm cleanser. Note: I don't use this on my eyes but I don't use any cleanser on my eyes, so no feedback here for that! I've tried so many cleansers, and this is the only one that leaves my face completely makeup-free. It smells divine, and nothing on the market compares - and I've tried for instance the REN balm (which has great reviews but can't compare, sadly) and a plethora of make-up removers. It's such a luxurious product, it feels like it's worth £65 pounds, and although it is expensive I will continue to purchase. The 200ml is of course a way better value than the 100ml which is why it's no shock that this one is currently sold out... Hopefully it will be back soon! I started my Journey of cleansing balms with this little gem and I went for the supersize from the beginning. I loved it..but it thought, well there must be others out there, better 20 cleansers later, I realize this is THE ONE. Very very nice packaging, sweet relaxing amazing smell, does not sting at all my extra sensitive eyes, and removes makeup just like magic by using just a small amount. Its everything I want in a cleanser and more. I would buy again, over and over. For the past 3 years maybe a bit longer I was introduced to EHAF moringa cleansing balm. From the very first application I was hooked. It is always in my arsenal and would NEVER not use this cleanser. From the minute you place the balm into the palms of your hands and warm it up before applying it to your face, the aroma, the feel, the consistency is remarkable and totally up-lifting. When I place my warm flannel on my face to remove the balm I am so confident that this incredible balm that melted into my face, pores and uplifted my senses has done exactly that to my skin, removing every trace of muck, grime and any impurity from the day. Sheer magnificence, leaving my skin so subtle and uber clean. The balm has other uses as well, I massage it into my cuticles of my hands and toes as well as using and massaging it into the backs of my hands, so lush! I sleep with it on my face and use it as a mask. Some were shocked but I even use it on my sculpt, and no, I am not bald! Also use it on my elbows, I am addicted to the smell. This is the only cleanser that I have ten hundred percent faith in and will try using it as my multitask balm. For me its just sheer magical. Their facial oil is brilliant but there are much better and nicer cleansing balms with a better price tag than this one. The smell is horrible and I didn't like the texture, within a week of using it my skin had gone 'bobbly' again which was very disappointing. I would recommend the Omorovicza Thermal Cleansing Balm over this one. This has change my skin so much. Its amazing. I can't believe how good my skin looks after just one week of using this product. I love how effortless this balm takes off my makeup. I love the nice slip it has and while I'm at it, I give myself a mini facial massage. Smells divine. Easy to work with. I only wish it was safe to remove eye makeup as well. I have tried other more expensive cleansers similar to this and they didn't agree with my skin at all. They didn't feel as though really cleansed my skin either. From the moment that I used Emma Hardie's Moringa Cleansing Balm it was a totally different experience. It's a thicker oil so it doesn't disappear and slip away as soon as it touches your face and it feels so luxurious and gentle on your skin even after using retinols. I love that you can use it as a treatment mask as well to soften and invigorate your skin. I've stopped buying moisture masks because this does a better job! It's almost as good for the skin as a warm hug is for the soul!